When you introduce a new pup to your home, you also have the responsibility of learning how to best care for your new best friend’s health. Your dog’s ears are one of the most sensitive parts of their body and need to be treated with special care. Depending on your breed, there may be specific ear-related health concerns to be aware of and be cautious of. Although it is always important to discuss your dog’s health care with your vet, here are some important facts you should know about your new pup’s ears from IHeartDogs.com. Unlike the straight shot of the human ear canal, your dog’s ears have an “L” shape. The 45-degree angle helps prevent debris and other infectious particles from reaching the eardrum. Unfortunately, sometimes those irritants can get trapped on the other side of this turn, which is why proper ear care is important. Most pups visit the vet at least once in their lifetime with an ear infection. This common experience can be caused by bacterial infections, yeasts, allergies, injuries, parasites and much more. To avoid these infections, the best course of action is to prevent them by keeping your dog’s ears clean – especially after grooming or swimming. To clean the ears, use a gentle cleanser purchased from your vet. It is best to avoid ear swabs and rubbing alcohol as these can cause accidental injury to your pup’s ears. 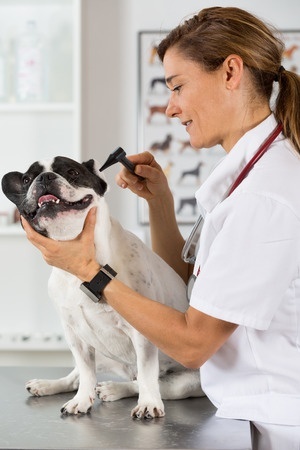 The most obvious symptoms of an ear infection will be redness, swelling, discharge or an odor coming from your dog’s ears, but some of the symptoms can be less noticeable. Other signs to look out for include head shaking, an irritated mood and obvious hearing loss in the form of not responding to commands or other noises. If you notice any of these symptoms, you should take your dog to the vet right away to check for an infection and get your dog the treatment he or she needs. Whether you already have a pup or are in the process of finding the right dog for you, it is important to know how to best care for the newest member of your family. In addition to these health tips, another factor in having a happy and healthy pet is choosing a dog from a certified breeder. Pauley’s Pups offers a wide selection of toy and small breed dogs, all from USDA-certified breeders. Find the perfect pooch to fit your lifestyle by visiting Pauley’s Pups in Ashland, Virginia, or call us at 804-798-7877 today for more information.